I think many people are confused by now that, why Google toolbar doesn’t work on Mozilla 5 and further versions. Well, the fact is that, Google toolbar used to provide some features which were not installed earlier in the Mozilla browser. Google says, Since Firefox has now installed some of the features of the Google Toolbar in-built, we now don’t think that we should provide Google Toolbar for Mozilla anymore. Some features are already existing right now into the Mozilla browser. Well, we all know the reason behind this. Coolpctips News Team has found some facts that why Google toolbar doesn’t work on Firefox 5 or further versions, to know more. read the article below. Why Google Toolbar Doesn’t Work On Firefox Version 5 or Further ? Google Toolbar will only supports the download of the toolbar till Mozilla versi0n 4. Further updates from Mozilla 5 are being stopped now. So Google Toolbar doesn’t works on versions up to and including Firefox 4. Google Toolbar cannot support Firefox 5 and future versions. The Google toolbar was introduced in 2005 and ever since that time, Google Toolbar for Firefox enabled syncing bookmarks to a Google account, which was the biggest need for any common user. According to recent reports, one third of Firefox users are still using Firefox 3.6 due to version 5’s Google Toolbar missing. Is Google Challenging Firefox Capability ? 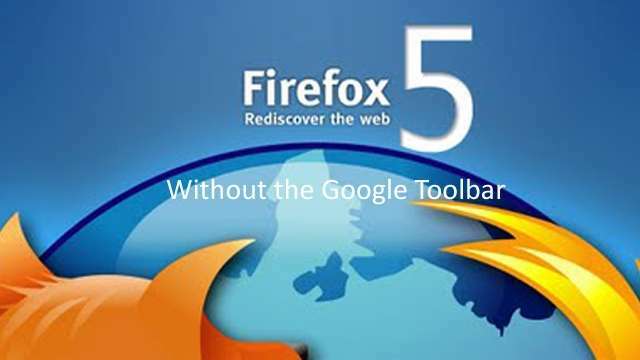 Google recently announced that they will not be supporting Google Toolbar on Firefox 5 and all newer Mozilla browsers. Google’s decision to cut the support will follow improvements in browsing technology from Firefox’s end and also throws a challenge towards the capability of Firefox establishing Google toolbar features.Google has also noted that Firefox 5 and higher users can download Google add-ones to their browsers. Which include features like AutoFill, page translation, page sharing, site thumbnails on a new tab, Gmail notifications, Bookmarks and etc. The other features like spell-check. find in page are per-built into Firefox 5. Google toolbar doesn’t work, Is this to protect Chrome ? Some Firefox users believe that Google is showing self-interest and promotion on their own browser, chrome. This might be one of the main cause of cutting the support of Google Toolbar from Firefox newer versions. Because Google chrome is the biggest competitor for Firefox now. Well, whatever it is between Google and Firefox, now Firefox users cannot download Google Toolbar if at all you are using Firefox 5 or further versions and Unless you don’t a have Mozilla Firefox 4 or lesser versions, Google toolbar doesn’t work.